Now that Stage 1 is over, figured I'll explain how you change techniques and whatnot. You can purchase and sell techniques at the shop between stages by selecting "Enter Shop" on the map screen. New Techniques as well as new Roulette Moves will be available every time you beat a stage. 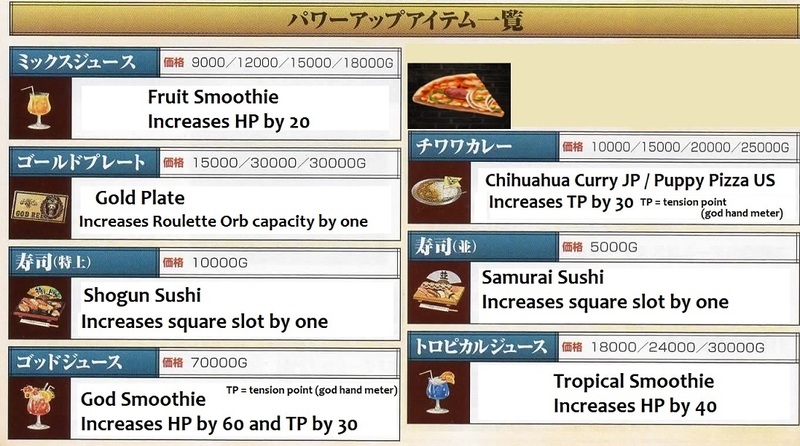 You can also buy upgrades for your health bar, god hand meter, roulette orb capacity and increase your square move-slot capacity in the POWER UP section. Press Start ingame to access the pause screen and Techniques/Roulette menu. R1/L1 to navigate through the different Techniques category. Side note, certain moves can share two properties, e.g. One-Two Punch belongs to both the Juggle and Launch category, the first hit juggles the enemy and the second one will launch him. You access every moves from here. Kick list moves go here. 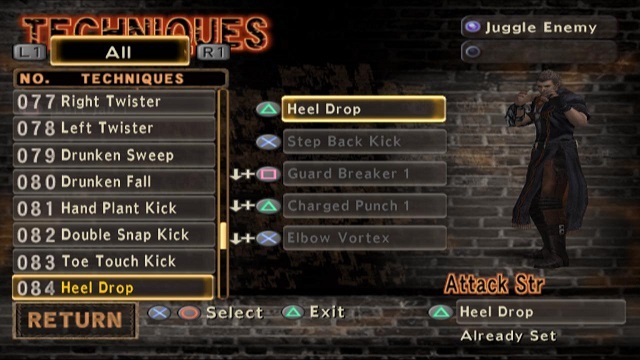 Since most kicks have a Launch or Trip property, it is unwise to use them in your square move slot, unless you're doing it for style or place kick moves at the end of the square slot, this way you can cancel the square combo before you reach the slot you put a Kick move in. Enemy will fly back after being hit. From level 1 to 3, enemies are weak to instant launches (Gene's running attacks for example) but not on DIE level. Juggle moves let you lift enemies in the air. Enemies are weak to juggles no matter the difficulty, although connecting a juggle isn't 100% guaranteed since there's a chance enemies can dodge it anyway. Juggle moves will send weaker enemies (the "basic thugs" weight type) right above Gene's bust at Air Launch Kick/Dragon Punch height. Elites or fat enemies aren't affected the same way and will only get lifted at waist height. There's only one Juggle move in the game that will lift Elites at Air Launch Kick/Shoryuken height without the need of landing the attack as a counter-hit like with Charged Punch: Double Snap Kick. Move category reserved to "Granny Smacker", a slow startup move similar to Yes Man Kablaam. Just like YMK, Granny Smacker has a hidden Break Guard property however it is highly unpractical. Granny Smacker will build up stun faster than every other moves in the game and is best used while having the God Hand active. A joke move, not much else about it. Guard Breakers let you break the guard of enemies who are blocking (duh), leaving them vulnerable for a couple seconds. Most of the Break Guard moves however are unpractical on level 3 and DIE level since enemies block for a shorter time than on level 1 and 2. It's best to stick with a fast and easily cancellable move like "Guard Breaker" or "Spinning Backfist" than being fancy with a "Haymaker" or "Spinning Sobat" since they are so slow. Only one move in the game has this property, Yes Man Kablaam. 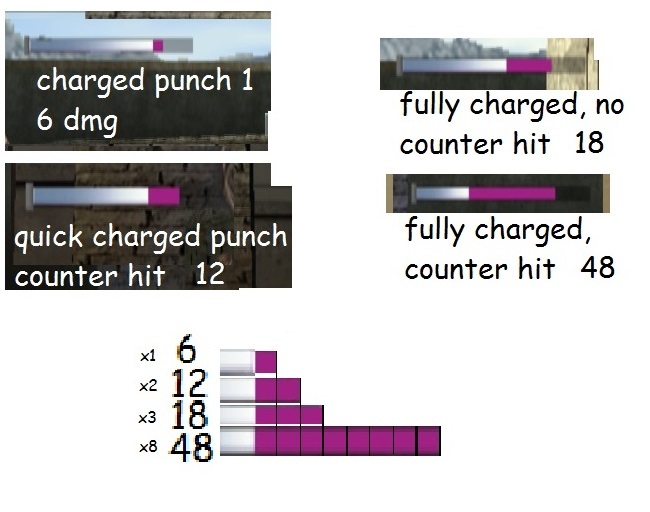 As explained in the previous update, its main use is to gain some God Hand meter back. Something that the game doesn't tell you though is that YMK has a Guard Break property. The move itself is very unpractical since the startup animation is awful. Launch moves with an unblockable property. Slow startup but perfect for crowd control. 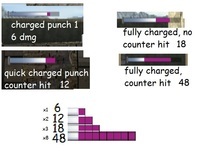 Best used right after a guard break or by timing it right as an enemy runs at you. Moves that let you evade high attacks, a mix of defense and offense. Completely broken, best used with moderation.